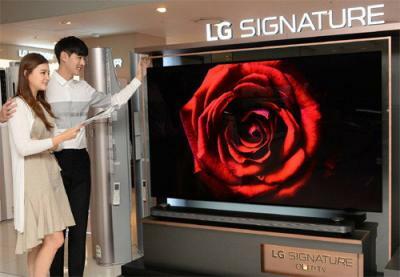 LG Electronics launched its 77" Signature OLEDW7 Wallpaper TV in Korea, with a price tag of 33 million Won (almost $30,000, although there's a 4 million Won discount if you order before the end of June). LG aims to gradually release its flagship TV globally in the coming months. LG's OLED W7 is the company's top-of-the-line OLED TV for 2017. The TV is extremely thin (2.57 mm all the way) and attaches to the wall using magnets. A thin cable on the bottom connects to the sound bar. Other features include a 4K resolution, HDR support (to four different standards), WebOS 3.5 and Dolby Atmos sound. The 65" model is now shipping for around $8,000. How does LG's Wallpaper OLEDW7 compare to last year's high-end OLEDs? LG gets its 2017 OLED TV certified by the WiFi alliance, will it include 0.97 mm wallpaper TVs?